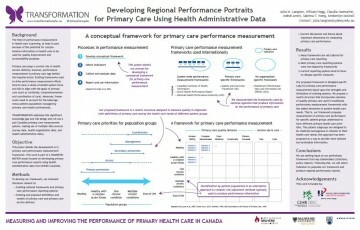 Patient-Reported Dimensions of Primary Care Performance. TRANSFORMATION Study Results for the Central Zone. Burge, F., Blackman, S., Halifax, NS (May 8, 2018) Slides available here. Citizen, consumer, and patient roles in using publicly reported primary healthcare performance information. Lessons from citizen-patient dialogues in three Canadian provinces. Johnston, S. Abelson, J., Langton, J., Wong, S.T. Primary Health Care Research Day, Halifax, NS. (May 17, 2017) Slides available here. Wong, S.T., Burge, F., Hogg. W., Johnston, S., Bouharaoui, F., Haggerty, J.Primary Health Care Research Day, Halifax, NS. (May 17, 2017) Slides available here. 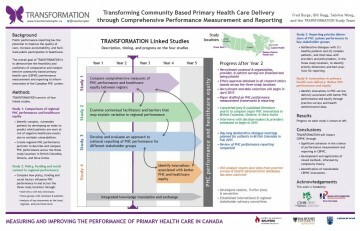 Primary Care Performance Measurement and Reporting. Preliminary findings for regional performance portrait. Burge, F. Grand Rounds (April 12, 2018) Slides available here. Burge, F. (March 7, 2018) Slides available here. Johnston, S. Continuing Professional Development and Access to the Data by Researchers. Washington, DC. (March 2, 2017) Slides available here. Click on a poster to view an enlarged version. Bill Hogg, Fred Burge, Sabrina Wong, and the TRANSFORMATION Study Team. Presented at the C.T. Lamont Primary Care Research Centre (CTLC) retreat, April 2015. Click on poster to see enlarged version. Julia M. Langton, William Hogg, Claudia Sanmartin, Mehdi Ammi, Sabrina T. Wong, Kimberlyn McGrail. Presented at Centre for Health Services and Policy Research 27th Annual Health Policy Conference, March 2015. David Peckham, Robyn Tamblyn and Sabrina Wong. Webinar presented to the Canadian Institutes of Health Research, March 2015. Slides available here. Sabrina Wong. 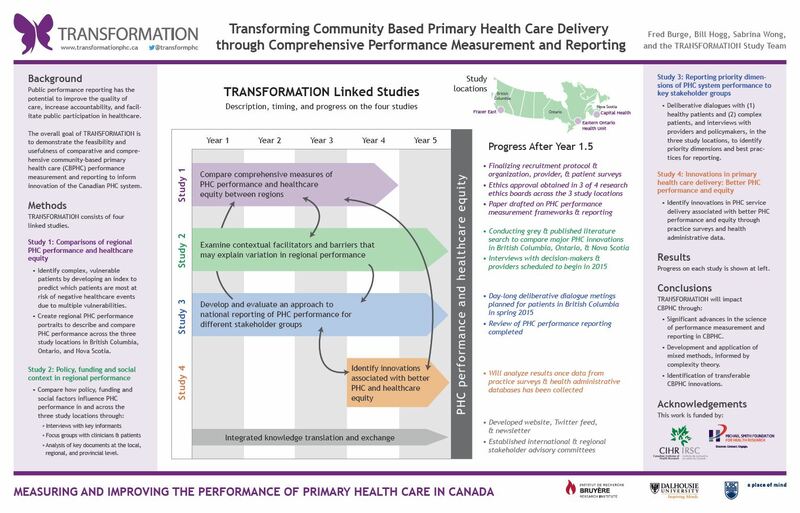 Webinar presented to the Canadian Institutes for Health Information Policy Rounds, February 2015. Slides available ­­­­­here. Bill Hogg and Sharon Johnston. Webinar presented to the Canadian Institutes for Health Information, February 2015. Slides available here. Fred Burge, Bill Hogg, Sabrina Wong, and the TRANSFORMATION Study Team. Presented at the Family Medicine Forum, November 2014. Bill Hogg and Sharon Johnston. Presented to Health Quality Ontario, September 2014. Slides available here.